As part of the PUrE Intrawise Project a study of the particulates and other pollutants emitted from energy use in residential buildings has been undertaken. Three UK case studies were performed, where indoor pollutants were monitored in different domestic environments. The quality of the indoor environment is affected by a range of factors, including the design of the building, ventilation, thermal insulation, energy provision, energy use and various other household activities. Maintaining the quality of the indoor environment can have considerable consequences on both the local and global environment, as well as on human health, especially since we spend around 90% of our time indoors. Although ambient air has a significant impact on the indoor air quality, several field studies have shown that the concentrations of indoor pollutants can be approximately two to five times (and occasionally more than 100 times) higher than outdoor pollutant levels. In addition to outdoor sources, there are various indoor sources of air pollution, such as emissions from fuel combustion (oil, gas, coal, biomass, etc. ), building materials (carpet, pressed wood furniture, etc. 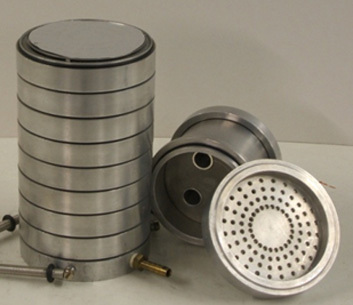 ), ventilation systems, tobacco smoke and household cleaning products. A major source of indoor air pollution is the use of energy within residential buildings, such as for heating and domestic cooking. When gas-fired cookers are used in a kitchen, various indoor pollutants, including CO, NOx and particulate matter (PM) are generated and emitted. There are a range of different appliances used for heating buildings, cooking and supplying hot water. In developed countries, cooking appliances comprise natural gas or propane-fuelled stoves and ovens, electric ovens and microwave devices. Gas cookers are not vented to the outdoors and as a result, they are potentially significant sources of indoor air contamination. Limited indoor air pollutant emissions data and the associated emission rates from heating and/or cooking appliances have been reported in the literature. 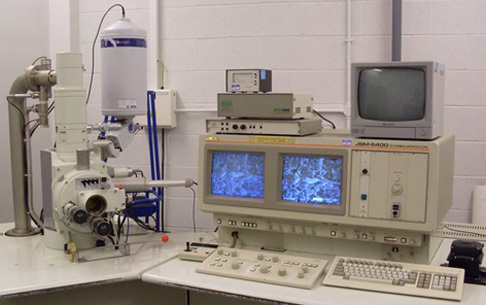 As part of this PUrE Intrawise project, the University of Sheffield is investigating the concentration of indoor air pollutants generated by various heating and cooking systems in residential buildings. The majority of experiments were conducted in the kitchens of these properties, as most heating and cooking systems would be located here. For the first Case Study, data was also collected from both the bedroom and lounge. For comparison and to investigate the ingression of pollutants from the outdoor environment, data was recorded outside these properties as well. 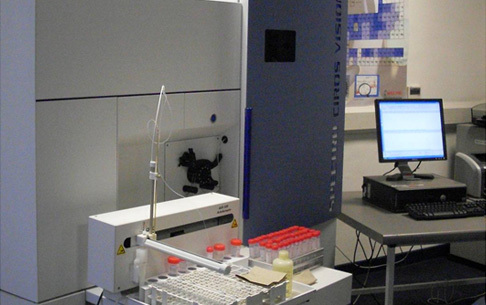 The main focus of this research was on experimentally-determining the real-time concentrations of both CO and PM. In particular, we assessed the levels of PM2.5 – particulate matter than is less than 2.5 µm in diameter, as these particles are classed as the respirable fraction; they are small enough to be inhaled and may have significant negative consequences on human health. 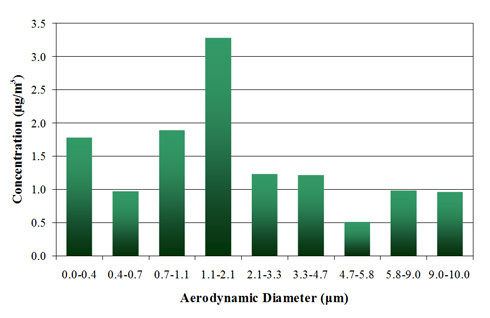 These particulates were analysed using various techniques to determine their particle size distribution using an Anderson sampler (Figure 1), particle morphology via SEM/EDS (Figure 2) and elemental composition by ICP-OES (Figure 3). The initial results for Case Study 1 - the stone-built detached house in a rural area with electrical heating and cooking systems – revealed that most particles were in the respirable fraction (less than 2.5 µm in diameter). This was true not only for the kitchen, as shown in Figure 4, but also for the longue and bedroom. Most particles from the outdoor environment at this location were also less than 2.5 µm in diameter and a high percentage were submicron (29% of particles were less than 0.4 µm in diameter). PM2.5 concentrations were monitored continuously in the kitchen, where the average concentration was 16 µg/m3, with peaks of 100 or 200 µg/m3 during cooking. From these data, the PM2.5 emission rates during these cooking periods were calculated; for this property, the emission rate was 5-23 mg/hr. 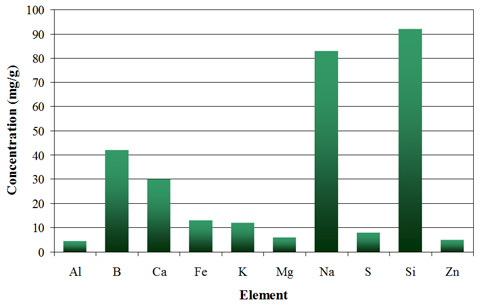 The subsequent ICP-OES analysis of these particles identified boron, calcium, sodium and silicon as the main elements, as illustrated in Figure 5. For the bedroom and lounge, in addition to these elements, there were also significant amounts of iron, zinc and sulphur. The majority of particles collected from the outdoor environment contained mainly potassium, sodium and sulphur. The morphological analysis provided by the SEM data for individual particles collected from the kitchen showed that they were predominantly salt crystals and salt-related particles containing sodium and chlorine (Figure 6a), skin and dust flakes containing carbon, oxygen, magnesium and silicon (Figure 6b) and bacteria or mould fungus spores, with high chlorine peaks and lower counts of sulphur, phosphorous and potassium (Figure 6c). Particles found in the lounge and bedroom had similar morphologies. The outdoor environment, however, had more dust fragments, cenospheres, pollen, mineral fibres and carbonaceous material. The full range of data measurements for each location included carbon monoxide, carbon dioxide, oxides of nitrogen, volatile organic compounds (identifying the 20 most common) and particulates, using a range of analytical equipment. Both the concentrations and emission rates were assessed for these. Data was collected for both the indoor and outdoor environments at each property. Air exchange rates have also been calculated for each property. These data are now being utilised to perform theoretical calculations using CFD (computational fluid dynamics) modelling using the FLUENT code. For further information about this study please contact Professor Vida Sharifi.